The FSFE needs you to continue spreading software freedom in Europe! × Traduire cette page ? Logiciel Libre, Société Libre ! Avertissement : Cette page n'a pas encore été traduite. Vous voyez ci-dessous la version originale de la page. Merci de consulter cette page pour tout renseignement sur la manière de participer, entre autres, aux traductions. Since 2001 the Free Software Foundation Europe empowers software users to exert control over the technology that is so deeply involved in every aspect of our lives today. As a non-profit organisation, our work is backed by the continuous and generous contributions of our supporters. From public campaigns to policy monitoring, from removing legal barriers to helping organisations in understanding how Free Software contributes to freedom, transparency, and self-determination, our supporters have helped to finance our work. On the European level, 2019 will be a particularly crucial year for software freedom and technological rights that will need your support. The EU Copyright Directive currently moving its way through formal Trilogue discussions threatens to impede the free flow of online information and enact onerous new legal barriers for Free Software developers. The looming elections for the EU Parliament in May will seat politicians with the legislative power to impact the Free Software movement in Europe for the next five years. To help them get started, we are releasing a comprehensive policy brochure as part of our "Public Money? Public Code!" campaign, which will be used to provide candidates for the EU elections in Spring 2019 with background information about the benefits of Free Software for the public sector. We will also hand over our signatures from individuals and organisations in Europe in our "Public Money? Public Code!" open letter, and continue our movement to demand that code paid for by the people should be freely available to the people. And of course, in 2019 the FSFE will again use public awareness campaigns and political lobbying, provide our expertise, and produce promotional material and explanatory videos, to bring our community to diverse events in Europe and let them talk about the freedom of software. To achieve our goals, we base our work and form our movement with the help of our community and friends, who ensure that our message gets out and is heard in as many diverse parts of our society as possible. You can directly help us to master these upcoming challenges in 2019 by becoming a supporter of the FSFE. Any amount that you give will be greatly appreciated. Your contribution makes a huge impact today, tomorrow, and ongoing! If you would like to know more about the FSFE’s ongoing work, our 2018 yearly report gives you a better and more detailed understanding of the projects that we are presently involved in, which projects we want to realise in 2019, and what we have accomplished over the past year. Certains services peuvent ne pas être compatibles avec les Logiciels Libres et abîmer votre vie privée. En savoir plus. 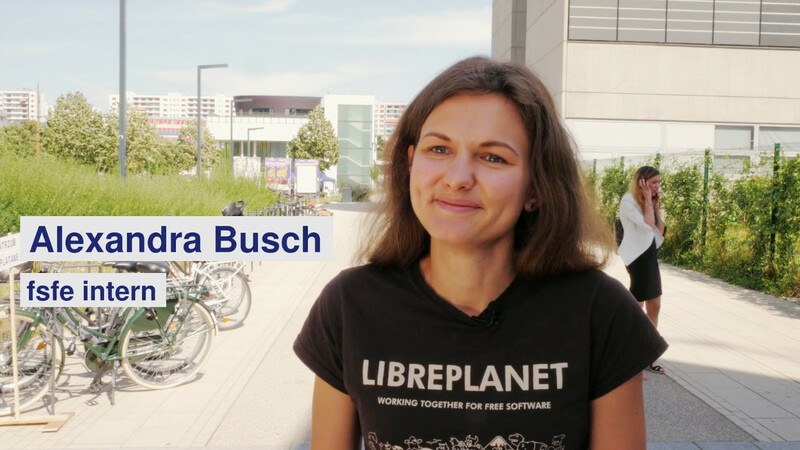 La Free Software Foundation Europe (FSFE : Fondation européenne pour le Logiciel Libre) est une organisation qui redonne le pouvoir aux utilisateurs sur la technologie. Le logiciel est profondément impliqué dans tous les aspects de nos vies. Il est important que cette technologie nous donne le pouvoir plutôt qu'elle nous limite. Le Logiciel Libre donne à chacun les libertés d'utiliser, copier, modifier et redistribuer les logiciels. Ces libertés aident à soutenir d'autres droits fondamentaux comme la liberté d'expression, la liberté de la presse ou le respect de la vie privée. La FSFE a des organisations sœurs en Amérique du nord, en Inde et en Amérique latine.